Janet Kern checks out kale still in the fields last week at Busa Farm. By next Thanksgiving, Lexington will have wrapped up its first year as a town with a community farm. The peppers, eggplants, and tomatoes of late September will have been harvested, the leafy greens of autumn will have been eaten, and the winter storage roots — parsnips, turnips, carrots — will have been pulled out of the earth. The two farmers in charge of the land will have spread cover crops like winter rye, oats, and peas to limit erosion and fertilize the soil through the winter, and they will be examining numbers and planning for the 2015 growing season. “At this point next year, the cover crop will have emerged, a beautiful blue-green winter rye, which continues to grow into the heavy frost,” said Dan Roberts, a farmer from Community Farms Outreach, a nonprofit that will handle the agricultural side of operations on the property. 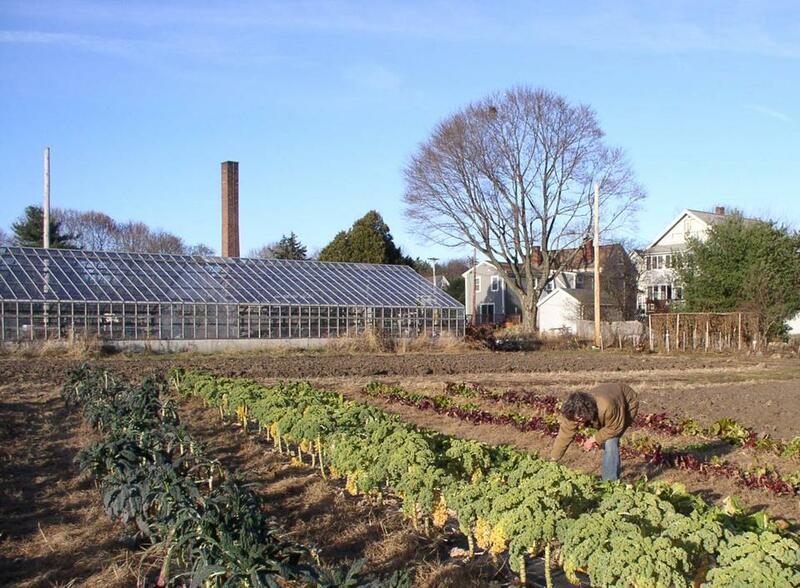 If all goes according to plan, this end-of-season wrap-up will occur after a spring, summer, and autumn of community-supported agriculture shares, a farm stand, and education programs at the town’s first community farm. A local nonprofit, the Lexington Community Farm Coalition, signed a lease with the town on Nov. 18 for the 8-acre property on Lowell Street that will become the farm. Kern said besides offering produce through the CSA and the farm stand, organizers will strive to donate food to Lexington residents in need. 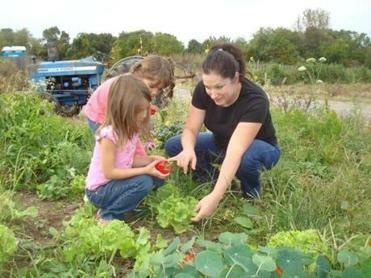 Nancy Gold helps Olivia and Nicole Tanionos of Lexington harvest vegetables last month in LexFarm's children's garden. She also said the community farm will emphasize educational programs, including a small plot where Lexington’s children can learn about farming, workshops for adults addressing topics such as worm composting or seed saving, and volunteer opportunities. “Lexington is known for its wonderful school system, but I think there’s an education people are looking for that involves hands-on understanding of what our food system is all about, what our environment is all about, how everything is connected,” Kern said. The journey toward the creation of the community farm began in 2009, when the town purchased the Busa Farm property for about $4.1 million. The town spent several years debating whether to turn the land into recreational fields, while a group of residents advocated for preserving the property as a farm. The selectmen voted last year to use most of the land for a community farm, with a small portion set aside for affordable housing. LexFarm’s proposal for the property was selected this summer over a competing proposal from Fat Moon Farm in Westford. LexFarm will pay the town $2,000 to lease the property the first year, with a 2.5 percent increase each year after that. The lease is for 10 years, with the option to renew for five years twice. Kern said shares in the farm’s harvest, through its community supported agriculture program, will go on sale after the new year, and the CSA will run through the end of October. During its preparations for the growing season, LexFarm will solicit donations so it can fix up the roof and farmstand, and buy tractors and farm equipment for organic farming. Kern said LexFarm will oversee business operations and fund-raising, while Roberts and fellow farmer Erinn Roberts will handle the agricultural duties. Claire Kozower, executive director of Community Farms Outreach, said her organization helped LexFarm with research while it was advocating to preserve Busa Farm as a community farm. When the town issued a request for proposals for leasing the site, LexFarm asked Community Farms Outreach if it would team up with the local residents and help them farm the property. “We thought about it, and for us it represents a great opportunity to fulfill the farmer training goals we have for our organization,” said Kozower. LexFarm is holding public gatherings to provide details about its plans at 7 p.m. Dec. 11 at Cary Memorial Library, 1874 Massachusetts Ave., and 7 p.m. Dec. 16 at Brookhaven at Lexington, 1010 Waltham St..
Emily Cataneo can be reached at emilycataneo@gmail.com.